Last night I had the pleasure of attending FIS 101 at Oakton Community College, otherwise known as Introduction to Commodities & Futures Trading. Russ Rsezsutko has taught Intro to Commodities for the last 15 years, and when I met him at the Roots & Culture “We are all Beginners” reception, he told me I could drop in on his class. Born and raised in Back of the Yards, Russ is classic Chicago, and fully embodies the trader personality – he’s a live wire, pacing around the room while lecturing a mile a minute in one of the best Chicago accents I’ve heard so far. He’s been a broker for over 3 decades, and the experience shows. This was the first class, so we went over the history of growing, buying and selling commodities and their evolution from straight cash transactions to forward contracts to futures contracts. I also learned the difference between speculation and gambling – yep, there is a difference. All of this made me super excited for tonight’s “Commodities 101” session at Mess Hall, because Russ is one of the speakers. He’s going to give a whirlwind introduction to futures (if this means he has to talk faster to cover it all in 15 minutes, watch out!) and then we’ll launch into questions. Russ’s counterpart on the panel is Paul Maggio, a senior VP at Newedge, a large international brokerage firm. If Russ is “old school”, then Paul is “new school,” although he’s been working in futures for nearly as long as Russ has. When I met Paul, I was surprised at how calm, soft spoken and downright mellow he was. It’ll be a study in contrasts and, if the conversations I’ve had with these guys is any indication, a fascinating discussion. SO, one more time: Mess Hall, 6932 N. Glenwood (red line Morse stop, then 1/2 block south), 7-9 pm. Be there! Afterwards, your assimilation of this knowledge will be tested, should you choose, in the form of a PIT tournament. Starting this week, Mess Hall, an experimental cultural center in Rogers Park, is handing the reins over to me for two weeks of Industrial Harvest-related programming that YOU, interested reader, should attend. Since I started this project, people have been asking me about solutions and alternatives to our current commodity / staple crop system. As we transition into a new season and the concluding half of the Industrial Harvest, I wanted to begin to look at solutions. All of the events will be very interactive discussions with fascinating panelists and experts, and I’m hoping we can use them to think together about these systems, how they serve us, and what we can do to change and shape them into the future (I’ll also be camping out in MH several days a week, hanging out and giving out flour, so you can also just drop by during these “office hours”). The schedule of events is listed here and here. Mess Hall is located at 6932 North Glenwood Avenue, Chicago (Morse stop on the Red Line). Hope to see you there! This bread, a test of the all-purpose (white, unbleached) flour, was unattractive but very tasty. 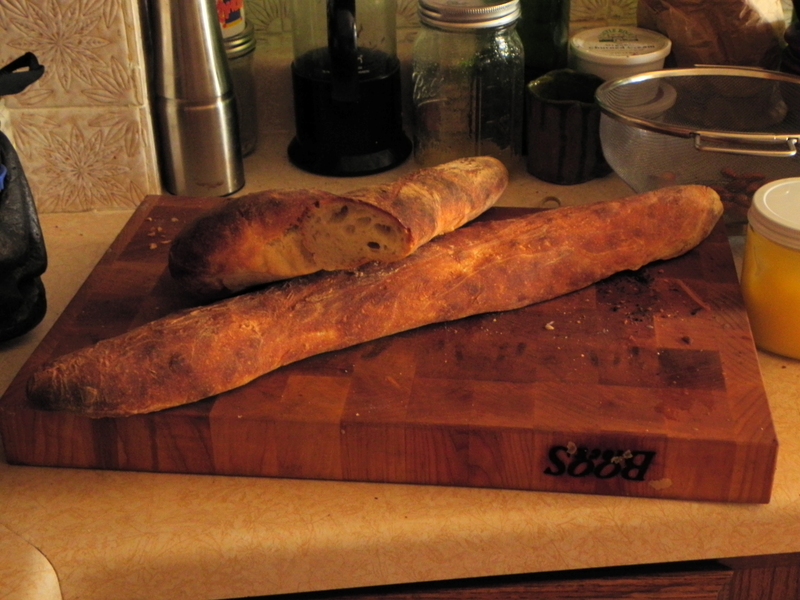 Since the artisan bread baking class with George DePasquale I’ve had more successes than failures. A little light reading for the summer. 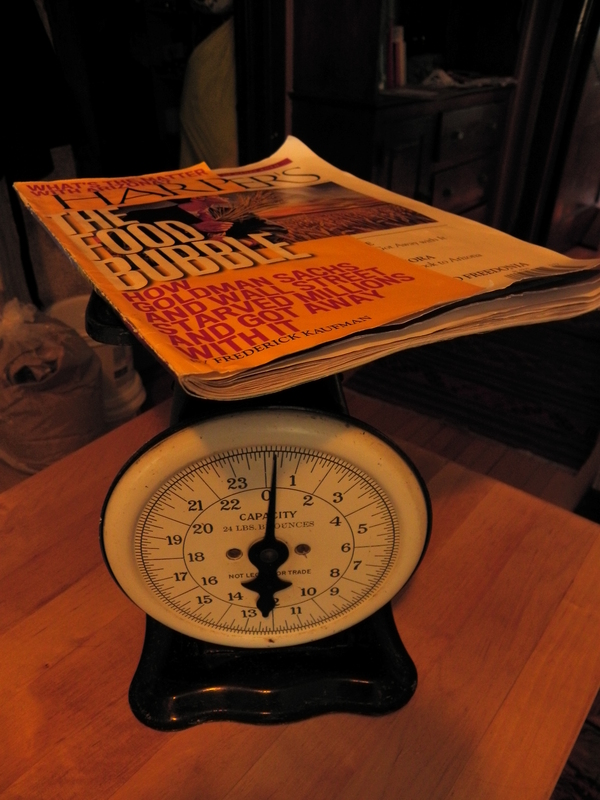 The vintage scale is a recent purchase.